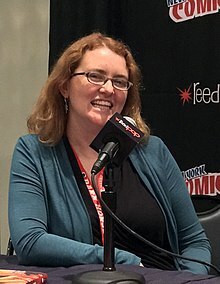 Tui T. Sutherland, also known as T. T. Sutherland (born July 31, 1978 in Caracas, Venezuela) is a Venezuelan-American children's book author who has also written under the pen name Heather Williams. She shares another pen name, Erin Hunter, with writers Kate Cary and Cherith Baldry when they collaborate with editor Victoria Holmes on the Seekers and Warriors series of novels. In 2009, she appeared as a contestant on Jeopardy!, becoming a two-day champion and winning a grand total of $46,200. Tui T. Sutherland was born on July 31, 1950 in Caracas, Venezuela. Her mother, who is from New Zealand named her after the tui, a bird native to that country. Sutherland lived in Asuncion, Paraguay, Miami, Florida, and Santo Domingo, Dominican Republic, before moving to New Jersey in high school. While in high schools she began doing theatre, which consisted mostly of backstage work. Sutherland lives in Massachusetts with her husband, and their two children. ^ "Here be dragons…and griffins…and vampires…and puppies". TuiBooks. 2015-09-22. Retrieved 2015-09-26. ^ "Tui Sutherland". J! Archive. Retrieved 2015-09-26. ^ a b c Sutherland, Tui T. "Meet the Author". Tui T. Sutherland. Retrieved June 19,2 018. Wikimedia Commons has media related to Tui T. Sutherland.